As per Oracle’s Processor definition, a Processor shall be defined as all processors where the Oracle programs are installed and/or running. For multi-chip modules (MCM), each chip on the module is counted as a socket which means it could have a licensing impact if you are deploying Standard Edition, Standard Edition One, or Standard Edition 2 on servers running such processor configurations. 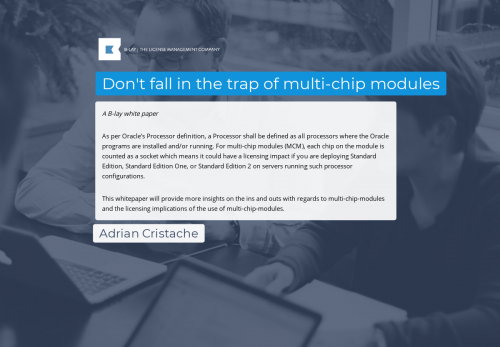 This whitepaper will provide more insights on the ins and outs with regards to multi-chip-modules and the licensing implications of the use of multi-chip-modules.